When doctors, nurses, and other medical professionals are reckless, careless, or otherwise negligent, their actions (or inaction) can lead to serious injuries. When seeking compensation for injuries caused by surgical errors, expert testimony is crucial to secure an appropriate verdict or settlement in specialized fields within medical malpractice. With over 25 years of experience in personal injury, John B. Kenison, Jr. understands how to find credible testimony to help clients get the restitution they need. As your surgical error lawyer, he will fight to protect your right to compensation so you can recover from your injuries. If you were injured at the hands of a trusted medical professional in Manchester, NH, contact our law firm to speak with Mr. Kenison about your case. Mr. Kenison can use expert testimony and draw upon his past experience in medical malpractice to provide the evidence needed to hold negligent medical professionals responsible for the injuries they caused you. Mistakes like these can lead to permanent or even fatal injuries. Victims and their families have a right to hold negligent medical professionals responsible for the injuries their negligence caused. In the event that a surgical error has caused permanent damage, Mr. Kenison can also seek compensation for any alterations that may need to be made to your home or vehicle to accommodate medical equipment, such as a wheelchair. 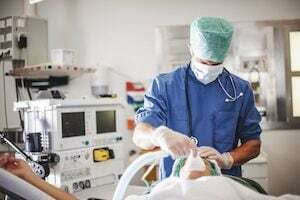 A surgical error lawyer like Mr. Kenison has an extensive network of connections in a variety of industries. He has worked hard over the past 25 years to make strong connections with experts whose testimony can help in securing a favorable settlement or verdict for his clients. To establish medical malpractice and liability, he will rely on the expert testimony of these medical and non-medical professionals. He can use this testimony and his knowledge and experience in medical malpractice to provide the evidence needed to hold the negligent doctors responsible. This often makes the difference in clients receiving the full amount of compensation they deserve. Mr. Kenison offers victims of medical malpractice a free initial consultation to perform an in-depth review of their case and discuss potential next steps in regard to filing a claim. He handles every case with each client’s best interests in mind, going to trial when necessary to secure the verdict they deserve. If you or a loved one was the victim of a surgical error, call Kenison Law office at (603) 471-3550 or contact us online today to schedule your free consultation.